The Homemade Hamsa is a Middle Eastern symbol who's purpose is to provide protection against the evil eye, or bad luck that occurs from the jealousy of others. It is a hand, often upside down, with two thumbs and an eye in the middle. The eye is usually always blue in color. You will often see The Hamsa in Middle Eastern homes. It may be painted on a wall, or as a plaque which hangs above a door. It is also very common in the Middle East to wear necklaces with the Hamsa symbol as a pendant. The Hamsa is part of the Jewish and Muslin culture. 1. Place your hand on a piece of paper. Trace everything but your pinky finger. Place your other hand over top of the tracing, and outline your other thumb print where the pinky should be. 2. Cut out your hand print, it should look like the one in the picture. 3. 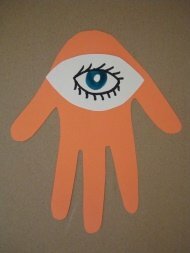 We cut out a white eye shape and then drew an eye in the center. This is not necessary to be a Hamsa - as long as it has a hand, with a (blue) eye in the middle it is a Hamsa. The rest is up to you artistic interpretation. 4. Glue your eye to your hand. We did our Homemade Hamsa like a picture you would hang above a door. Another option is to cut small shapes, from cardstock paper, and thread through a piece of twine or string and make a necklace.